Home furnaces and heaters are intricate systems with a range of components that must all be working adequately to sustain the desired level of function. Homeplace Heating & Air provides a scheduled maintenance program that features twice-a-year checkups to ensure your heating and furnace system is work properly. It is very expensive to replace a full heating system, but this can often be avoided by keeping your current system working well. Our regular maintenance inspections begin with evaluating the cleanliness of your system, inside and out. Many times, simply cleaning your system thoroughly can improve its performance. From there, we check all system components, flue venting, gas lines and pressures, safety controls electrical connections, and amperage draws on motors and compressors. Any problems we find are quickly repaired to restore proper function. It is important to note that most major heating system and furnace component failures can be averted by catching the problem early enough to keep it from developing into a greater issue. Most often, signing up for a regularly scheduled maintenance program will actually reduce your overall HVAC system upkeep costs by addressing small issues before they become larger, much more expensive problems. 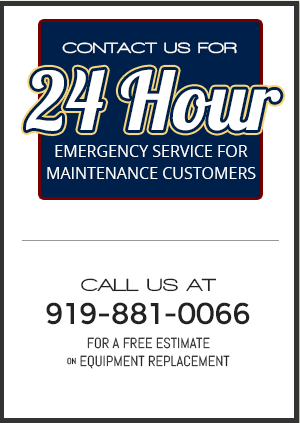 Homeplace Heating & Air also offers 24-Hour Emergency Services to customers who are already enrolled in our regularly scheduled maintenance program. This enables you to call on us any time, any day to address your HVAC emergency needs, from strange smells and noises, to water leaks, gas leaks, reduced effectiveness, and on to full system failure. Call us today at 919-881-0066 for a free estimate and let Homeplace Heating & Air handle all of your furnace and heating system regular maintenance needs.